Romio has been on the yard for 3 years; all we no about him is that he came over from Ireland so would assume he has hunted. He is a big gent who loves to work qualified Dengie novice championship Dressage and has won jumping classes. 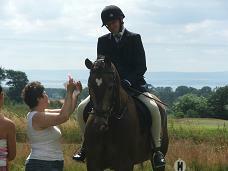 He is a regular member of the riding school and ponyclub.